H2O Plants Aquatic and Environmental Services began trading as a company back in 1996. However, there is a combined total of over 60 years knowledge and expertise in our staff members. When I was 8 years old my father brought an aquatic garden centre so you could say my working future was decided back in the 1980’s. Most nights after school and every weekend were spent watching my father carry out various maintenance jobs at the garden centre. To name a few, water changes on the fish tanks, cleaning the multi chamber filters, back flushing the sand filters, re fibreglassing the holding tanks, changing UV bulbs, treating fish in the quarantine tanks prior to sale to the public, making sure the pond plants looked presentable, feeding the fish and any other jobs that needed doing. After 5 years of trading my father decided to sell the shop and open an aquatic plants nursery that only supplied to trade customers like the garden centre he owned previously. From this point on, most weekends were spent watering plants, potting up, weeding, fertilising, getting labels ready for the following weeks deliveries, loading up vans and the general up keep of the nursery. This was different to the previous work as they were more fish and	pond related and these works were more of a horticultural type. Owning the nursery led to various works supply and installing aquatic plants and water lilies to places such as Hampstead Heath ponds in London for The Corporation of London, the River Lee at Bayford in Hertfordshire for The Environment Agency and Rainham marshes in Essex for The Wildlife Trust to	name a few. Yes was the reply so now we started to build ponds for members of the public. 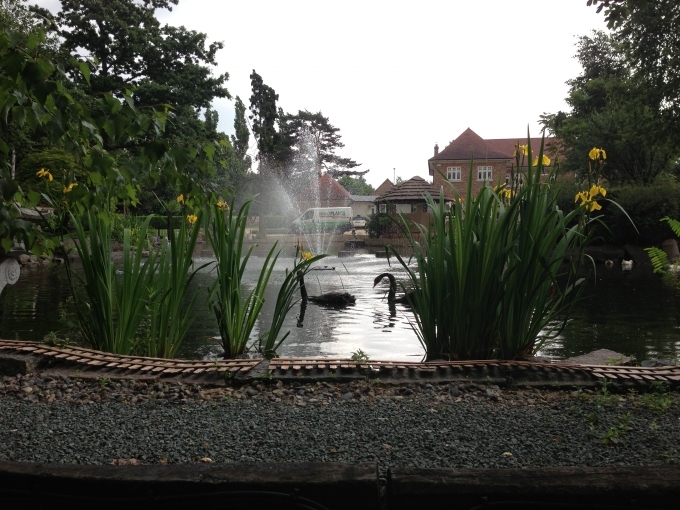 As time went on we were also contacted by commercial customers to help with various ponds, lakes and water features that they wanted built, maintained and repaired. The list of services that we could provide was now growing and so too as the list of clients who were using these services. One day would be spent installing a new pump for a filter, the next removing water lilies from fishing lakes, the next cutting back weed from a private moat, the next getting fallen trees from a park lake (Not the nicest of jobs in January but we all have to earn a living somehow!). We also maintained a trout river for one day a week called The	Amwell Magna (please see testimonials page) in Stansted Abbotts, Hertfordshire. This is the oldest fishing club in England and the work involved	cutting the streamer weed in the river, creating riffles, removing over hanging Willow tree limbs from the far bank,	pulling up the Himalayan balsam to prevent its growth, creating reed beds, raking gravel, helping with fish	stockings and basically any work that the members required or could not do. We started to get more and more work both removing fallen trees from lakes and also removing excessive weed	growth from ponds and lakes by hand. There was an easier way to control the weed however, having been involved with the plants at the nursery I knew	that to use pesticides on other people’s property and especially anywhere near a water course or lake you had to	be trained by the NPTC in the safe use of pesticides. So off i went and gained the following NPTC qualifications	PA1,5 and 6 all units which allows me to apply all pesticide if it has label clearance on land and in or over water	including from a boat throughout the U.K.
Whilst on the course I also enquired about the safe use of a chainsaw certification as this would make our work	easier when doing any tree works and then promptly booked myself onto the course. I now hold the following NPTC qualifications CS 30, 31, 36, 38 and 39 which enables me to safely fell small trees	and carry out chainsaw works from a rope and harness in a tree. As you can see the list of potential services has grown again to include vegetation management and trees surgery. With an ever growing list of services H2O Plants Aquatic and Environmental services were now being asked to tender for large commercial projects at places like The Water Gardens, Harlow, Essex. This was a site that had undergone a multi-million pound regeneration project that include the renovation of several ornamental ponds, ornamental gardens, new offices for	Harlow Council and the building of a new shopping centre. We won this contract, had staff based there who carried	out regular ponds maintenance on a daily basis such as cleaning fountain heads, removing litter from the ponds,	making sure there was no blanket weed growth, feeding the fish as well as grass cutting, weed control, flower bed	maintenance, hedge cutting, tree works, jet washing of pigeon droppings and general day to day grounds	maintenance work. The managing agents for The Water Gardens now began using our services all over the south east on commercial sites in	Bedfordshire, Buckinghamshire,Hertfordshire, Suffolk, London, Kent and Essex. Whilst working on one of these sites we weere asked if we would be intrested in cleaning up after a large amount of pigeons had been roosting there and making a mess of the place. I decided to look at gaining a qualification in pest control if we were to get more of this	of work. This was something that i had carried out at an amateur level in the nursery if we ever had mice or treating	the various common nursery pests like aphids, caterpillars, etc... and also working on the trout river I had trapped	mink that were causing issues. I looked on the internet and booked myself on a Royal Society for Public Health level 2 course in pest control. This qualification means I am covered to treat all pests including rodents, insects, mammals and birds. I have also	been on numerous extra courses to keep my knowledge updated and courses that i have added since	are the safe use of aluminium phosphide, the safe use of air weapons and various other supplier courses. Once again another service added to the list that we could provide. WE DO NOT PROVIDE A PEST CONTROL SERVICE ANYMORE! Although these services are all different they all go hand in hand with each other for instance we have been to look	at ponds that are leaking. The reason they are leaking is that rats have gnawed through the pond liner so we end up	replacing the liner and treating the rats. We have been called in to see why peoples water lilies aren’t growing and	point out to the owner that the several Canada geese on the lake will be eating the new shoots which will stop the	lilies from growing. We get the works to replace the lilies after we have removed the geese by culling them. We	have been cleaning ponds and explaining that the large over hanging willow tree will be depositing vast amount of	leaves each year in to the pond, so the filters will need regular servicing, the pond will need a yearly clean and that	if the tree was to have some pollarding works carried out this would also help. We leave the customer with the tree	works to carry out as well as the regular pond maintenance. In the time we have been trading we have worked for The Royal Parks, Thames Water, South East Water, Mid Kent	Water, The Environment Agency, The Corporation of London, Mouchel, Mid Kent Fisheries, Lee Valley Parks,	Enfield Council, Broxbourne Council, Harlow Council, Redbridge Council, Barking & Dagenham Council, Epping	Forest District Council, Newham Council, Barking Council, The Alexander Palace Charitable Trust, The London	Wildlife Trust, Aquarius Hotels, Exclusive Hotels, McDonald Hotels, B&Q, Standard Life Investments, schools, golf	courses, fishing clubs, farmers, pubs, landlords, managing agents, property developers, garden designers	(including Diarmuid Gavin's Chelsea show garden in 2007), Housing associations and 1000’s of private pond,	lake, water feature, fountain and waterfall owners all over London, Essex, Cambridgeshire, Bedfordshire,	Hertfordshire, Suffolk and Norfolk.